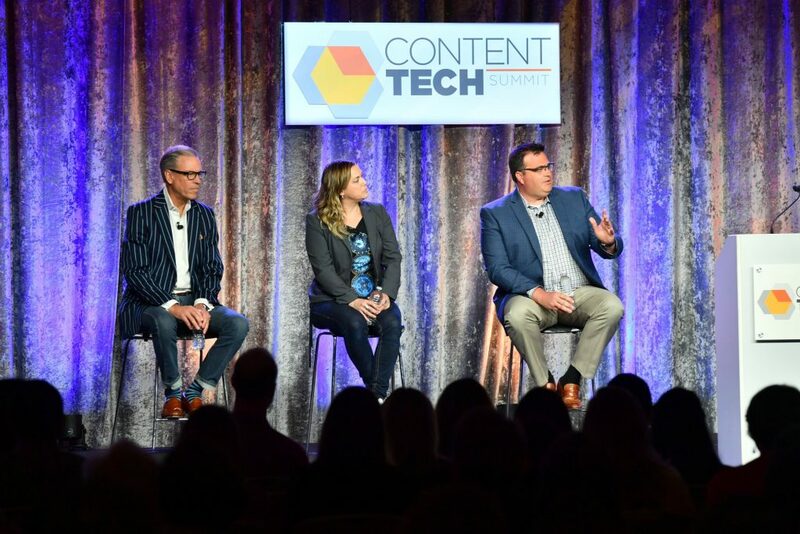 Last week, Bidtellect swarmed the inaugural ContentTECH Summit in San Diego, CA as the platinum sponsor. 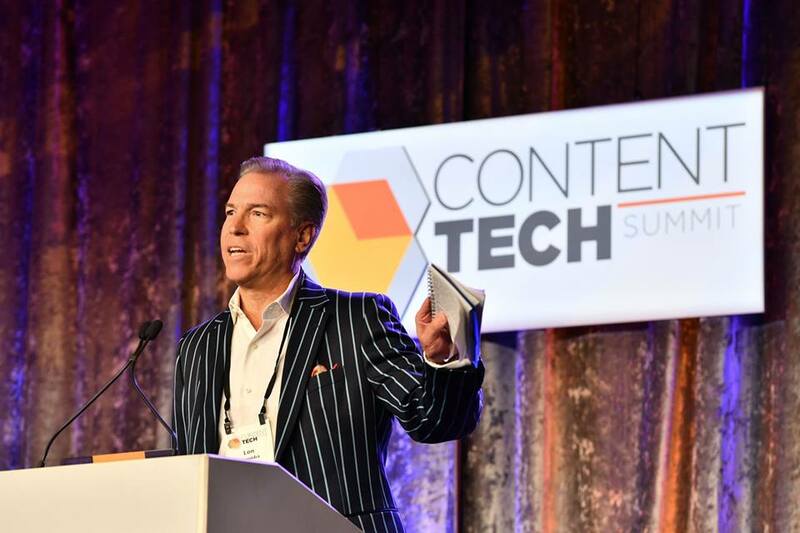 We were proud to be at the forefront of a conference filled of content game-changers and digital gurus, spreading the content distribution gospel to eager audiences. While we wish we could stay in sunny San Diego forever, we can reminisce on our favorite parts of the invigorating conference. Here are our top 5 favorite takeaways. 1. The New NEW Content Stack Panel. What a power panel. This group represented each phase of the content cycle: determine what to create to best represent your goals/brand, how to create the very best and most engaging content, and then how to distribute it effectively and get it in front of the right eyeballs. Sitting on the panel included Lon Otremba, Bidtellect’s CEO, Corrinne Schmid of ScribbleLIVE, and Marty Muse of Vennli. Cruce Saunders did an incredible job moderating, guiding discussion, finding connections, and giving high-level overviews and bite-sized summaries. At each turn, panelists discussed the importance of using technology and advancements in AI to your advantage when creating and distributing content, but not to a fault – nothing can replace a human writing beautifully. AI and advanced optimization technology (hi Bidtellect!) can place content in the most contextually relevant placements for optimum engagement. A huge takeaway? 5% of content gets 95% of engagement. And Lon’s quotes were heavily quoted and trending on Twitter, especially “If content is King then content distribution is King Kong.” Amen. Lon Otremba, Corinne Schmid, and Marty Muse on the New New Content Stack Panel moderated by Cruce Saunders. Image courtesy of Content Marketing Institute. This may seem like a small detail, but it honestly made such a difference. Kudos to the Marriott Marquis San Diego Marina. Right on the Marina, the views from the hotel windows were incredible, as was our final rooftop lunch overlooking the water. More importantly, though, the staff at every turn was helpful and so kind. When one of my vendors was lost on his way to drop of our booth furniture, the head of valet personally spoke to him on the phone and guided him to the right entrance, while another team member rode in his truck with him. It’s hard to put into words how much extra stress that relieved. Help was at every turn – from the wait staff to the onsite UPS store to the concierge. The beautiful weather and poolside cocktail receptions were also gorgeous and made for spirited and happy conversations after sessions all day! Oh, and the food. Oh my goodness. So much and so good. 3. Lounge Seating is the Key to Booth Love. So Are Live Demos. That’s right, if there’s anything our savvy Head of Marketing Missy Steiner taught us, a place to sit brings people by the droves. 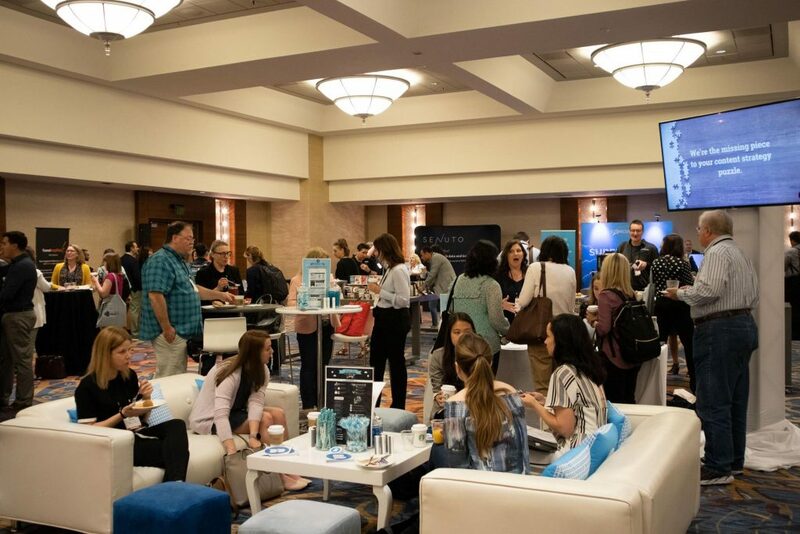 We set up an awesome lounge in our booth space with sleek white couches, a white coffee table where we displayed ample collateral and yummy candy to snack on, and a cool high top table and seating to chat and work at. Everybody wanted to come hang. We accentuated this with a TV monitor that displayed an original promo video with stats on stats. Speaking of Key Booth Experiences, we also did two LIVE DEMOS of the platform. Our COO Jason Boshoff walked through putting creative assets into the platform to create optimal Native Ads and showed viewers what they looked like out on the web. Amazing. It really helped attendees understand at a concrete level what we’re capable of. 4. Your Brain on Content Matters. The Bidtellect team all agreed that this was one of the most interesting sessions at the Summit. 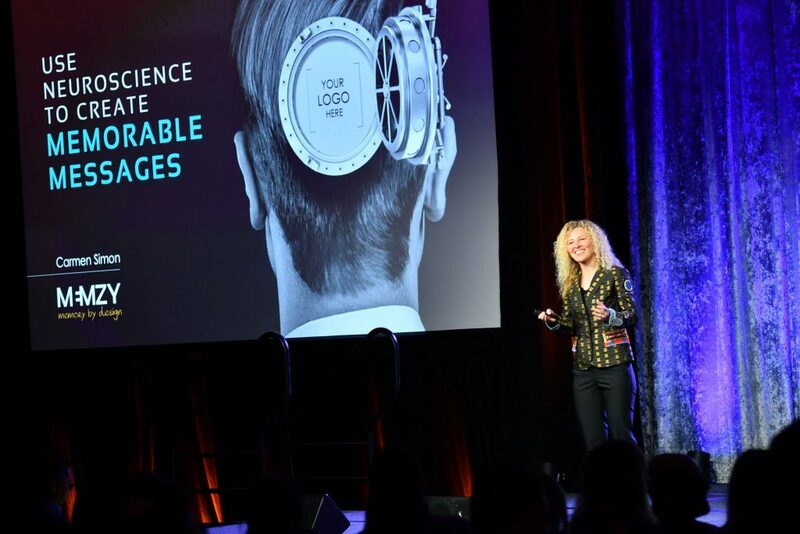 Cognitive Neuroscientist Carmen Simon of Memzy gave a full presentation on the brain, focus, stimulating interest, and how to create memorable messages. This means everything from asking questions (“Do you agree?”) to using movement and video for key statements at pointed times, plus habits to adopt, color schemes, communication styles, creating relevance, and more. I’m counting down to when these slides become available so I can memorize them. Some key new habits to adopt: Allow for some similarity and then deviate from the pattern. Balance abstract and concrete content. Direct focus and clarify the reward. Carmen Simon of Memzy. Image courtesy of Content Marketing Institute. What. A. Powerhouse. 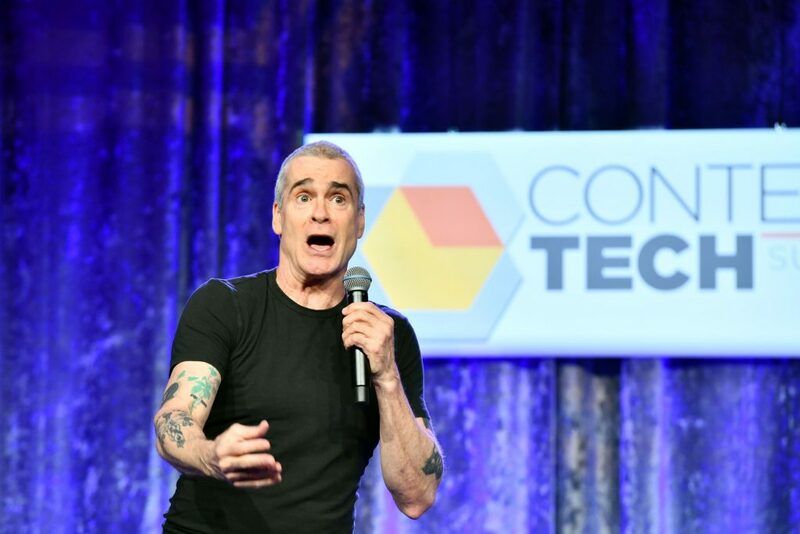 The Summit’s closing keynote speaker was Henry Rollins: singer, writer, actor, speaker, podcast host, leader, and advocate. He is the ULTIMATE power content creator. His message was simple: your words matter. You can use your power to do good or you can be reckless with it. He took us through his own story: stumbling into becoming the lead singer of rock band Black Flag with no money to his name, to creating his own band Rollins Band, to acting, to writing numerous books and columns, and then to traveling the world and speaking to troops, at hospitals, and conferences, to launching a podcast, he understands the power of messaging and the beauty that the right content distribution can bring. The message you send matters. This man was full of energy, humor, and wonder, and proof that staying true to yourself can not only determine your path but inspires others to do the same. Henry Rollins. Image courtesy of Content Marketing Institute.